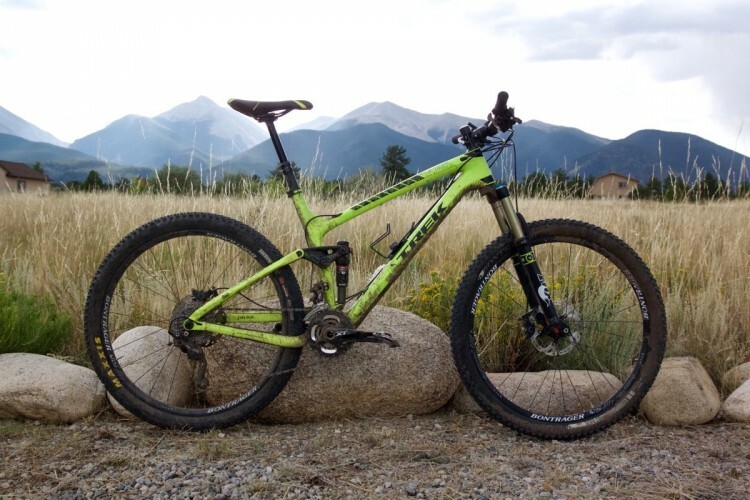 The Trek Fuel EX is consistently ranked among the top trail bikes by Singletracks readers, thanks to its prowess at both climbing and descending. 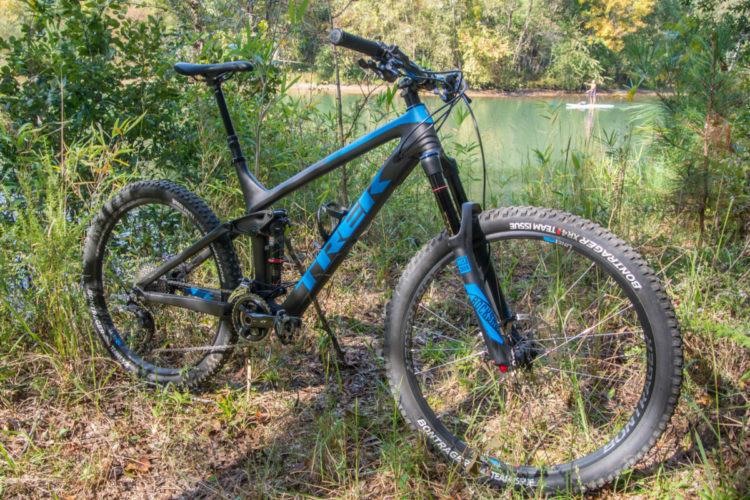 For 2017, Trek changed things up a bit, pitching the Fuel EX as a 130mm trail bike that can run either 29er or 27.5+ wheels, with updated geometry to make everything work. 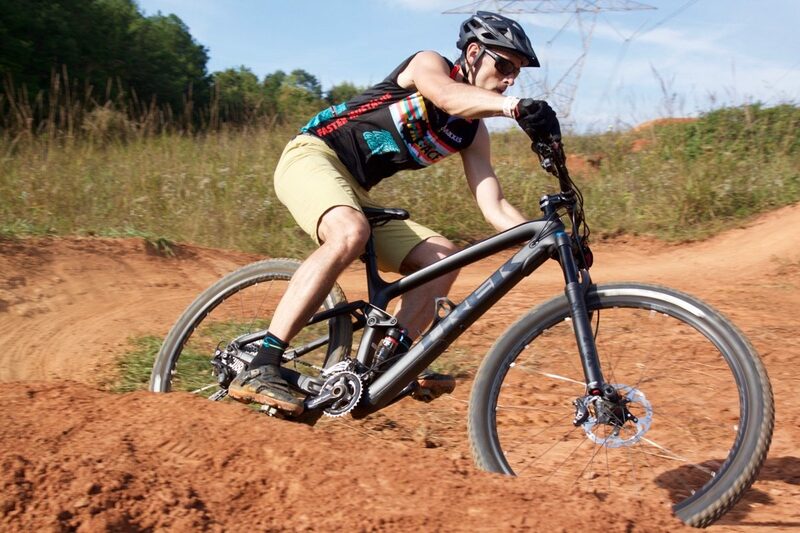 I tested the nearly top-of-the-line model, the carbon-framed Fuel EX 9.8, in North Carolina last month, and here’s what I found. 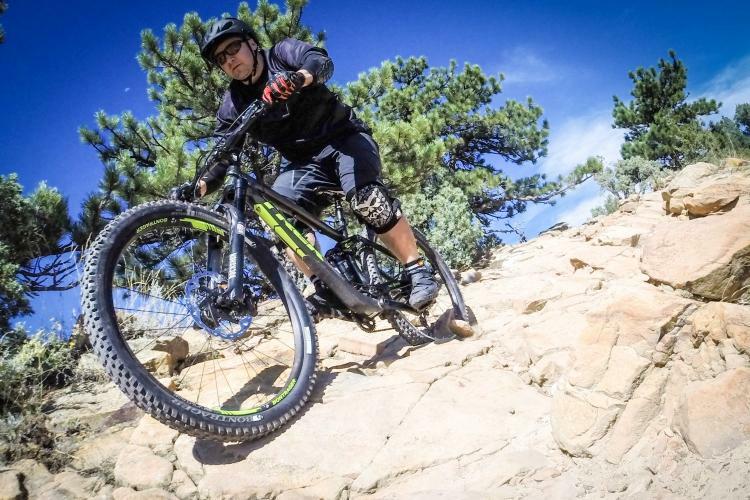 In 2016, Trek offered Fuel EX frames in both 29er and 27.5 wheel sizes. This year, the 27.5 option is gone, replaced with a single 29er model that is officially capable of running 27.5+ wheels. Anecdotally, it sounds as if the 29er Fuel EX build is outselling the 27.5+ four to one, but hey, it’s good that consumers have options. Like many 29er bikes that have been introduced this year, the Fuel EX features a chip, called the Mino Link, that’s used to optimize the geometry for the wheel size du jour. Even if the rider isn’t swapping wheels, the Mino Link can be flipped between two positions to switch the bike’s geometry for a particular course or rider preference. Ok, so let’s talk numbers. The geometry chart becomes a little complicated within the shape-shifting paradigm, so I’ll mainly concentrate on the “high” geometry position, which happens to be the setting I used for my test ride. In this position, the effective head tube angle is 67.7°, a full degree more slack than last year’s Fuel EX. In the “low” position, that angle relaxes even further to 67°. In the “high” position, the new Fuel boasts a much longer reach compared to last year, growing from 471mm in a size XL frame (tested) to 487mm. The chainstays managed to shrink on the newest Fuel EX as well, going from 436mm to 432mm. If your eyes glossed over at any point during that last paragraph, here’s the takeaway: the 2017 Fuel EX is longer and slacker than the 2016 model. Now, adding to those changes, Trek increased travel from 120mm front and rear to 130mm front and rear, and also beefed up the tires a bit from 2.3″ to 2.4″ Bontrager XR3s. If there was any prior doubt about where the Fuel EX sat on the XC/Trail line, the 2017 model makes it clear: this is now a solidly modern Trail bike. Visually, one of the biggest changes to the Fuel EX frame is the new straight down tube, which Trek dubs the “Straight Shot.” Trek claims this allows them to increase the frame’s stiffness-to-weight ratio, but it does introduce potential new issues like having the fork uppers knock into the down tube at extreme turning angles. To get around this, Trek integrated a “technology” they call Knock Block into the stem, headset, and frame to prevent any issues. 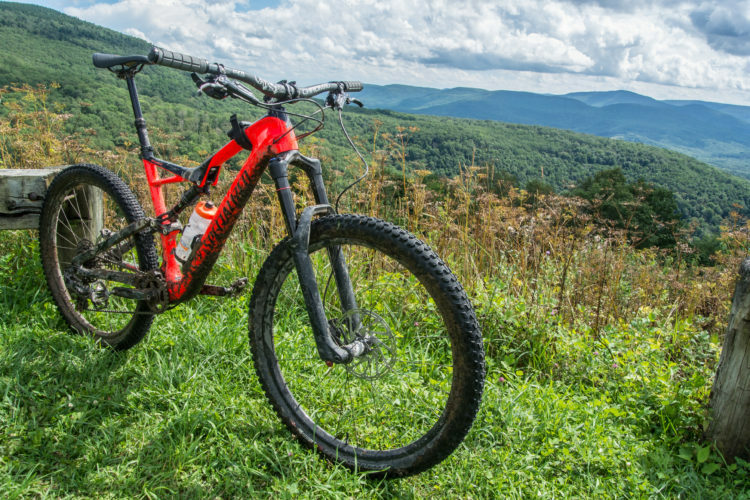 The Fuel EX 9.8 is pretty much top-of-the-line (only the 9.9 stands above), so the component spec on this bike is tough to beat. 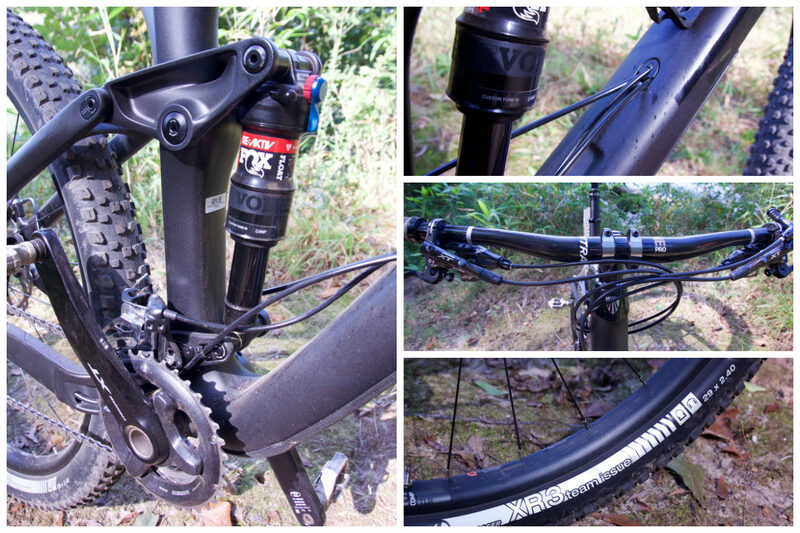 A Fox 34 Float fork sits up front with a Fox EVOL RE:aktiv Trek-tuned shock in the rear. Trek specs Shimano XT brakes and a Bontrager Drop Line 125mm dropper post, though my test bike was actually outfitted with a RockShox Reverb post like last year’s Fuel EX 9.8. Surprisingly, the Shimano XT drivetrain on the Fuel EX 9.8 comes with 2×11 gears, though as I overheard one dealer rep say, it’s easier for consumers to take a chainring off than to buy an extra ring, shifter, and derailleur. I suppose that’s true, but dropping a ring isn’t as simple as literally throwing away one of the rings. Most riders switching to 1×11 are going to want a single 32T ring, while the stock crankset includes a 36T and a 26T. Tracking down a 32T Shimano ring shouldn’t be too difficult, but that’s adding another expense on top of wasting money on a derailleur, shifter, and rings that aren’t necessary. Then again, I’m guessing Trek has run the numbers and they’ve found more consumers prefer 2×11 over 1×11. Democracy! Rounding out the bike spec, Trek throws in 750mm Bontrager 35mm carbon bars, a titanium-rail saddle, and tubeless-ready Bontrager Line Comp 30 Boost-ed wheels. The 2.4″ Bontrager XR3 tires are a nice touch and are wider than basically any other 29er tire spec I’ve seen. The Fuel EX 9.8 build retails for $4,999. My Trek Fuel EX test ride was one of five test rides in 24 hours, and it was easily my favorite bike of the five. We started our ride with a surprisingly fast, ripping descent down rooty, hardpack singletrack, and it didn’t take long for me to feel comfortable slashing the bike side-to-side through the turns. At times, a sharp turn in the trail would reveal an unexpected two-foot drop, and the Fuel EX 9.8 soaked up every bit of the impact, despite my poor line choices. On this test ride, Aaron and I also rode the slalom course and another jumpy power line cut, where I had no problem getting the bike in the air without fear of casing the landings. The Fuel EX 9.8 felt precise and most importantly, predictable, even in the hands of a rookie pilot. After the fun, initial descent at the beginning of our test ride, I started dreading the inevitable short, punchy climbs that were to come. I assumed that because the Fuel EX descended so well, it probably wouldn’t be great at climbing. Clearly I was wrong. The Fuel EX 9.8 climbs great, with a solid platform feel and again, noticeable precision. While the slackish head tube angle might seem prone to wander while climbing, I didn’t find that to be the case, and for this, I think the smartly-specced, 750mm-wide bars deserve some credit. It also doesn’t hurt that the size XL bike I tested only weighs about 29 pounds. 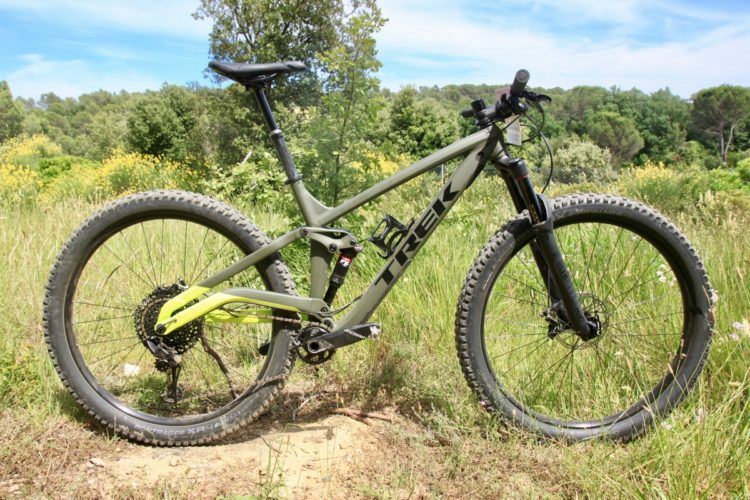 The Trek Fuel EX 9.8 is a great all around trail bike for mountain bikers who like to descend but also don’t mind climbing every now and then. The 2017 models feature smart geometry updates and component tweaks that are sure to please the modern trail rider. Notice the first sentence: “consistently ranked among the top…” but it ain’t the top. Specialized Stumpjumper man! Give that a test ride review! All right, getting my Specialized bias out of the way, the Trek Fuel is truly a thoroughbred bike. It looks good, rides great, and most importantly is fun. 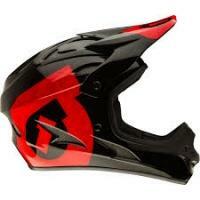 To Jeff: what trails were you guys testing it out on? I live in NC so I am curios. It’s been a few years since I’ve ridden a Stumpy, gotta get on the new one for sure! 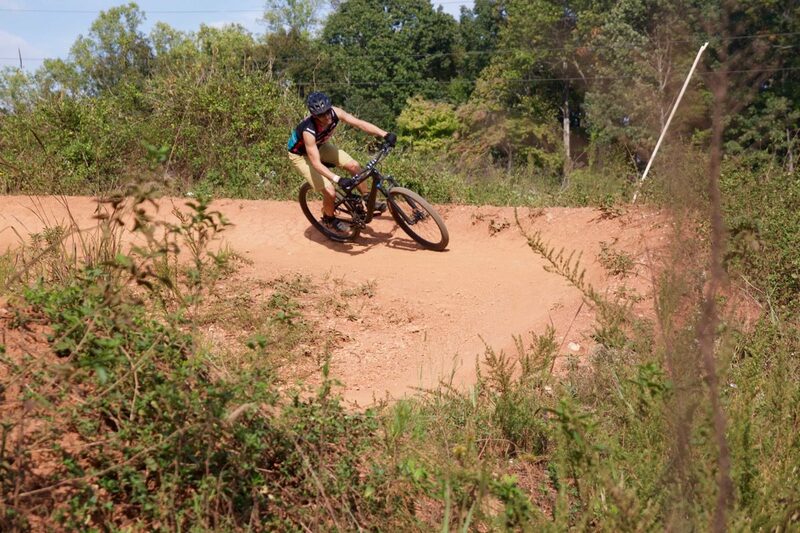 We were riding the trails at the US National Whitewater Center in Charlotte for Cyclofest. Yes yes I know that the Fuel won this year. But on the same poll Specialized won 3/5 of the categories. And which bike was right behind the Fuel on the poll? A stumpjumper. Heck ya. 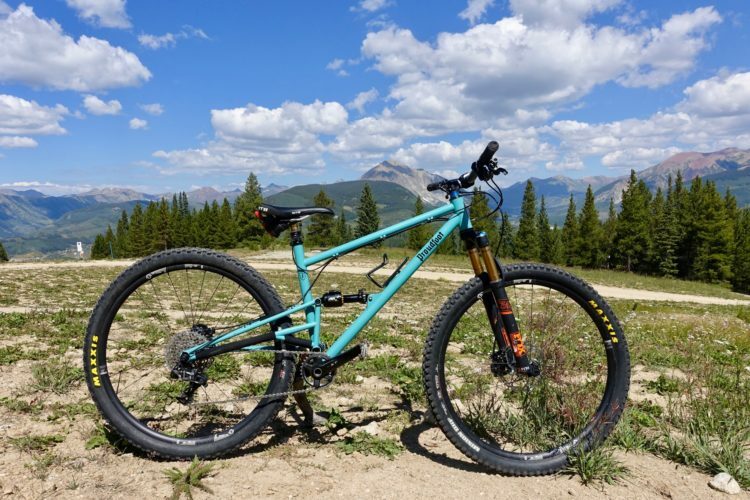 I would be really interested to see a test ride on the stumpy. By the way, the whitewater center in Charlotte is a great riding zone. Good choice for a testing area! Cool.. Not surprising to see this bike on the top! 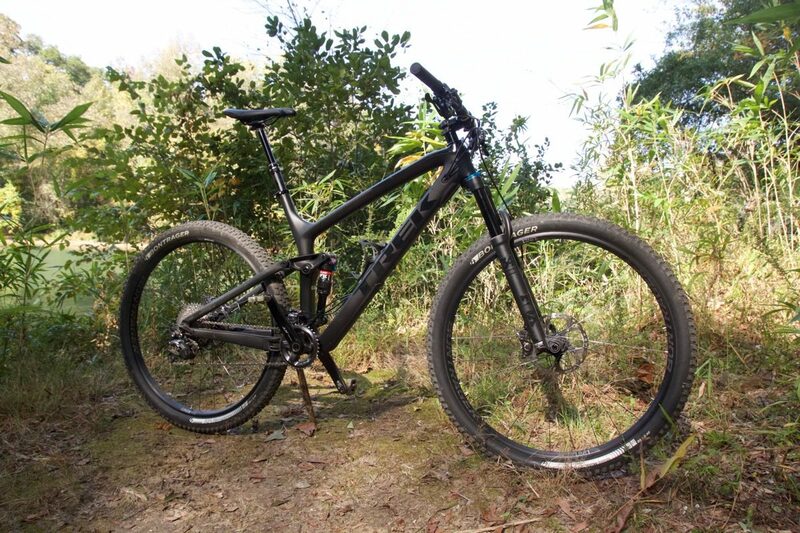 But interesting how Trek removed 27.5 from their fuel ex lineup.. 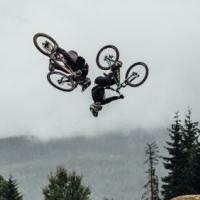 It would be a great pisgah bike. I have a the 16 remedy 29 which is essentially the same bike. The fuel is a tad bit snappier after riding it at cyclofest I think I would prefer it to my remedy living in Winston. All that aside when I do make it to pisgah the remedy amazes me every time. There isn’t on trail that gets me on that bike it litterally just rolls everything. It is no wonder to me why it won the awards it received.